1. I wanted to use Tohnloq again. And I wanted to finally use the "Word To Your Mummy" title, one that I didn't use for "Mummy Dearest". Al suggested "have someone out to get him"
2. I wanted a new enemy around, one connected to the Necromancer subplot. So I consulted Kyle's list, and found the Soul Tracker, who could be molded to fit both of the plot points. 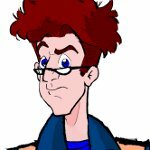 Add on Miss Janine's request to have her character meet Egon, and some posts on GBI and the GBWC board with "Egon" talking with Rachel, and everything just about fell into place. Funny. I particularly liked Jeff's bit with the Star Wars tribute. Lol...I'm a big fan of the Star Wars movies, so every chance I can come up with to work in a reference, I like to do it. I tried to work in a little subtlety into that bit, too: since the Soultracker apparently died in 1996, he knows all about lightsabers and Luke Skywalker, but Jeff's references to Count Dooku go over his head, due to being dead when Episode 2 came out.